The fashion cognoscenti’s breath was bated the moment it was announced, and a maelstrom of reports and rumours regarding who would be wearing whom hit the Internet like a blitzkrieg during the weeks leading up. You would be forgiven for thinking that we’re talking about the marriage of Prince William and Kate Middleton – but Monday night’s New York Metropolitan Museum of Art (The Met) Gala, and subsequent launch of the ‘Alexander McQueen: Savage Beauty’ exhibition, was this weekend’s hot ticket. Especially as McQueen designer Sarah Burton’s royal wedding triple whammy meant that the label’s name was on everybody’s lips. 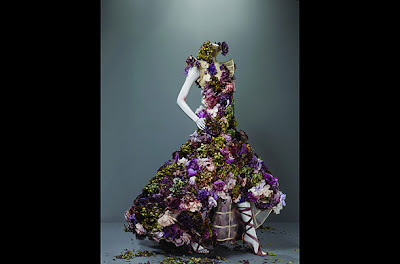 Chair of the organising committee, US Vogue’s Anna Wintour, couldn’t have stage-managed such a coincidence, or wished for a greater advertisement, for this sweeping retrospective of the late Lee McQueen’s 19-year career. Twitter was rife with Chinese Whispers leading up to the event. Would ‘That Dress’ be making a special appearance? Unfortunately, Anna Wintour’s considerable influence does not extend to British royalty, possibly a saving grace, for Burton’s demure designs for our new Duchess of Cambridge, which some commentators say lacked the provocative edge of McQueen’s best work. Lee would have approved of curator Andrew Bolton and co-chair Stella McCartney’s attention to detail. Backdrops have been designed by McQueen production team of Joseph Bennett and Sam Gainsbury, a miniature version of the (quite literally) showstopping Kate Moss hologram from the finale of the ‘Widows of Culloden’ catwalk show is included, and photographs of live models were manipulated to resemble mannequins for the exhibition’s catalogue. A cabinet containing some of the accessories featured in McQueen collections, including work by jeweller Shaun Leane and Philip Treacy’s fantastical hats, forms a centrepiece to an exhibition set to be a pilgrimage for fans from all over the world. 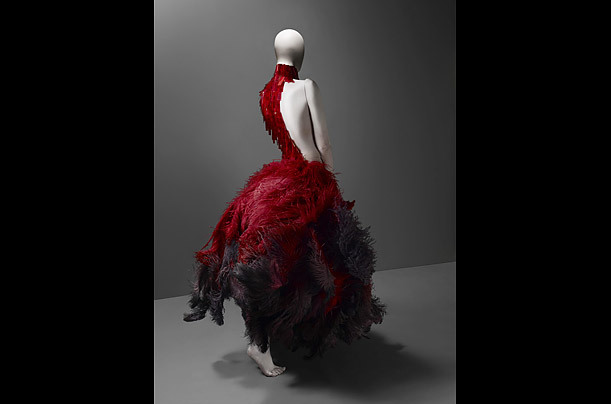 In a suitably McQueen-esque coup de theatre, muse and long-term friend of Lee, socialite Daphne Guinness prepared for her appearance at the Met Gala in the window of Barneys department store, her eventual appearance in a feathered McQueen dress wowing the assembled crowds. Guinness was one of several guests who chose to honour Lee, as did actresses Sarah Jessica Parker and Salma Hayek. Supermodel Gisele Bundchen posed for photographers in a dramatic floor-length red gown from the Autumn/Winter 2005 collection, and Karen Elson opted for the silver embroidered chiffon dress that she actually modelled ten years ago. However, the McQueen archive wasn’t represented enough in my opinion, and it is disappointing that some celebrities chose to wear Sarah Burton pieces or another designer, such as McQueen patron Gwyneth Paltrow who wore Stella McCartney. Another letdown was the rather matronly sequinned Chanel Couture sheath sported by organiser Anna Wintour. Surely a piece from the extensive McQueen archive would’ve been more appropriate? Several designers took their inspiration from the McQueen back catalogue. Renee Zellweger’s plunging backless Carolina Herrera was in tribute to the infamous torso-lengthening ‘bumster’ trousers, and the J. Mendel and Zac Posen dresses worn by Taylor Swift and Christina Ricci respectively felt heavily indebted to the McQueen aesthetic. Whilst all the major fashion houses were represented, it is quite comforting to note that even the triple A-list can get it wrong occasionally, such as Lucy Liu’s overly-fussy and unflattering Vionnet dress, or Miranda Kerr’s frothy, sugar plum fairy Marchesa worn with statement shoes. The undoubtedly beautiful Christina Hendricks is another who took a wrong turn – into a mediaeval-themed Las Vegas cabaret show lounge. And spare a thought for Beyonce, whose wannabe-McQueen Pucci added junk to her world-class trunk, and was so tight that it rendered her speechless. Rihanna’s bored expression whilst posing in a revealing Stella McCartney says more than I ever could about her choice of dress. We’re sure that Ri-Ri would’ve rocked one of Lee’s more avant garde outings. As the McQueen brand goes from strength to strength, the Savage Beauty exhibition is a startling reminder of the man whose artistic brilliance is its cornerstone. It will be an extremely long time before we see his like again. THE ‘ALEXANDER MCQUEEN: SAVAGE BEAUTY’ EXHIBITION AT THE NEW YORK METROPOLITAN MUSEUM OF ART RUNS FROM MAY 4TH TO JULY 31ST. YOU CAN WATCH VIDEOS OF PREVIOUS ALEXANDER MCQUEEN CATWALK SHOWS NARRATED BY MUSEUM CURATOR ANDREW BOLTON HERE. Article resreached and written by Lee Clatworthy for katiechutzpah.blogspot.com. What did you think of the Met Gala event’s outfit choices? Please let us know in the comment box below. Thank you.